At Giza's Estekama mosque, total quiet in mins after prayer. Then crowd at entrance erupts: "Islamic! Islamic.... Down, Down With the SCAF!" 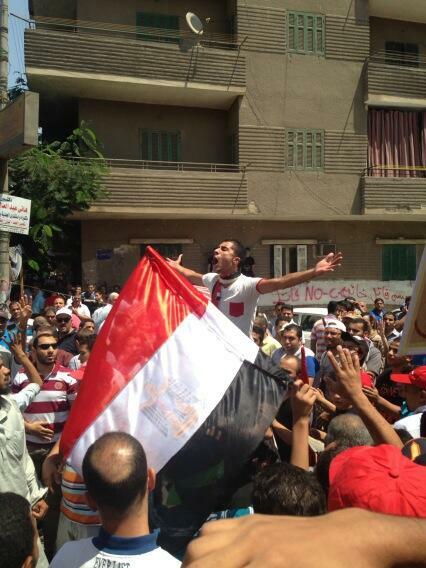 Small but aggressive crowd outside Giza's Estekama mosque: "Shoot us with the bullets! We are not afraid." 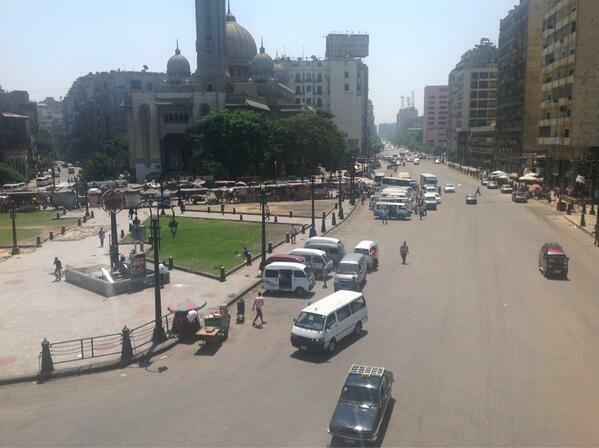 In Ramsis , back to the Fatah mosque there is no sign for the Muslim brotherhood. The mosque is already closed for renovation following the drama that took place there last Saturday. Bystanders at Giza's Estekama mosque say nearby square, the main one in Giza, is a meeting point for other marches. Abdullah, 27, in Estekama mosque crowd w Morsi photo, says he told wife b4 leaving: "I'm going down. If I don't return, I will be a martyr." 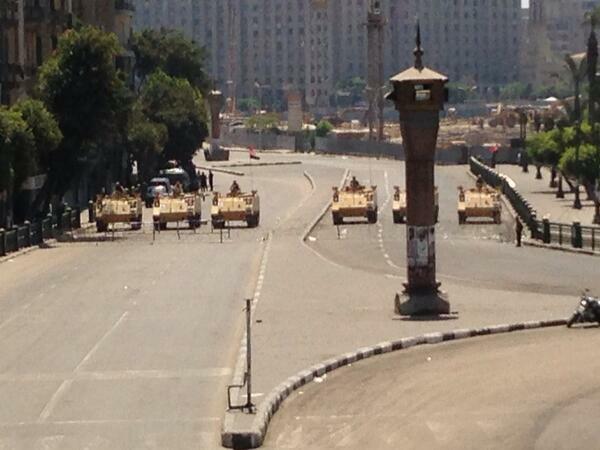 Military vehicles everywhere around Mostafa Mahmoud Mosque. The rallies have started in the governorates. Here is in Zagzig ,Sharkia. 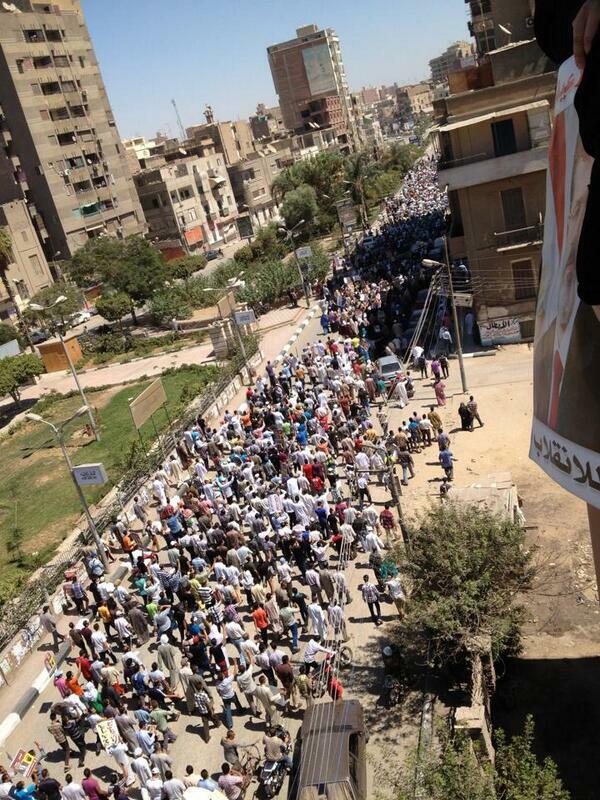 Now moving to Abbasiya , there is a small Pro-Morsi crowd in a very hostile area knowing for its support to the regime. 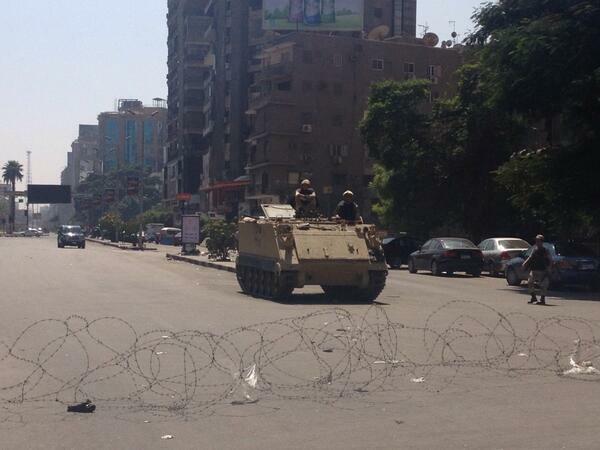 Despite Mostafa Mahmoud square is locked by security forces mainly army , the Pro-Morsi supporters reached there. 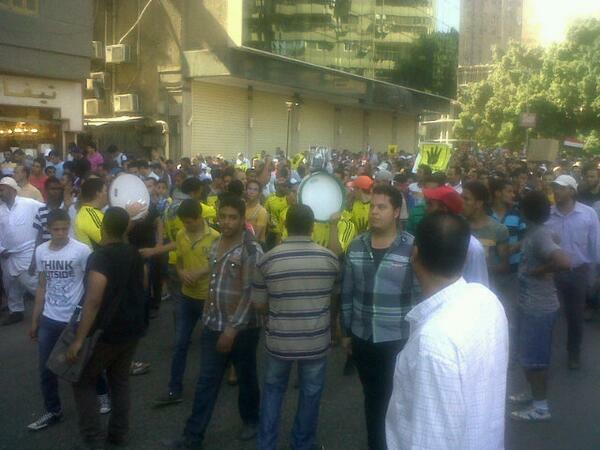 MB protest in Giza was just a very limited one and under the bridge. Traffic was going normally. 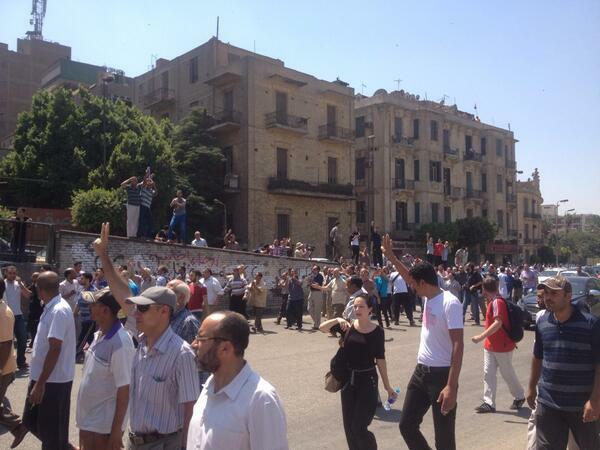 Meanwhile the revolutionary socialists had a short protest against Mubarak's release at Supreme court. The protest was was ended from very short time. "Down down with Mubarak" is back once again. A Pro-Morsi rally in Al Arish , North Sinia. A Pro-Morsi rally in Zaiton , Cairo. 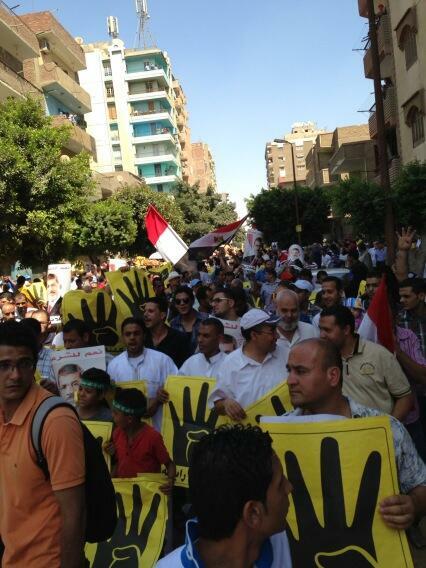 The Abbasiya rally along with other rallies in Salah Salem. So from what I see there are rallies in Cairo, Giza , Fayoum, Sharkia , North Sinai and Sohag. The numbers of the protesters so far are hundreds to few thousands. A pro-Morsi rally in Fayoum. Unlike other pro-Morsi protests, there is clear absence of women/children in #Helwan. Overwhelmingly young men here. Haven't yet seen a single Morsi pic at Mostafa Mahmoud march. 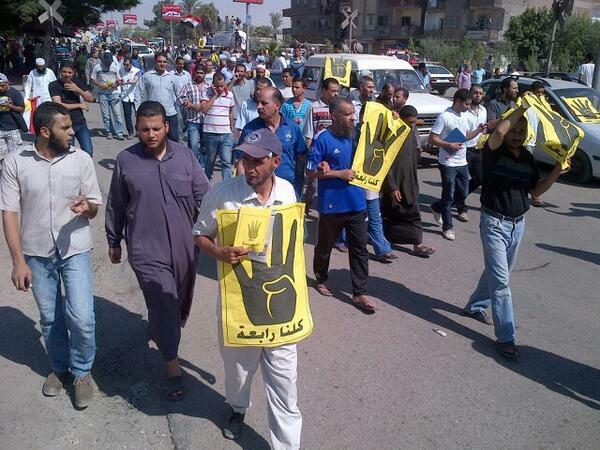 Plenty of yellow Rabaa posters being waved. Big difference from prev weeks. A Pro-Morsi protest in Alexandria. There are rallies there. 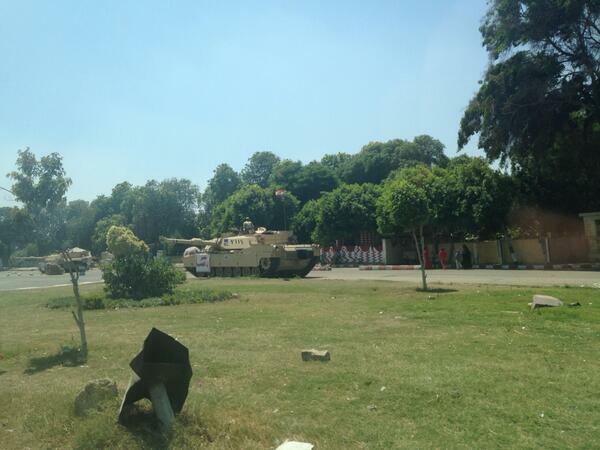 Clashes erupted between Morsi supporters and locals in several areas including Shubra "Cairo" and Tanta "Gharbia". 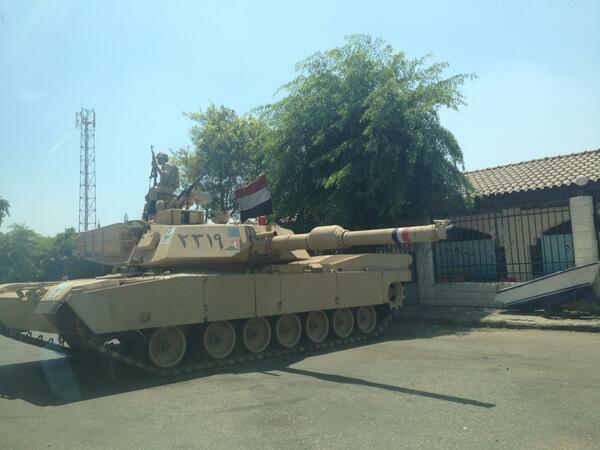 At least one is killed in Tanta. There is no live broadcast from there.